Today’s theme was on diverse communities in Israel: we learned some about the Arab communities, the Druze community, and the special needs community through our varied visits today. 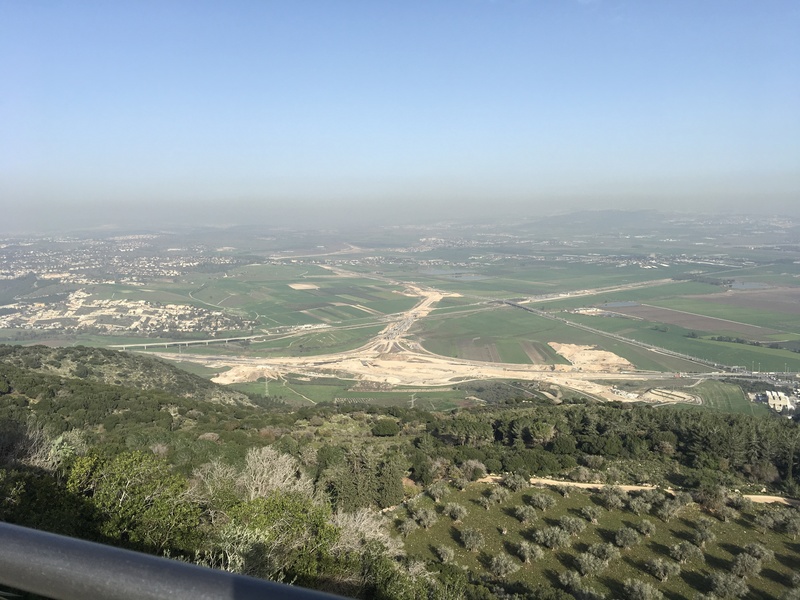 We departed Tel Aviv and headed to Givat Haviva, an educational center on a vast kibbutz-like campus that fosters a shared society between Israeli Arabs and Jews. Mohammed Darawshe, director of the Center, spoke about the economic, social and political challenges that Israeli Arabs face in Israel. First of all, he said that Israeli Jews and Arabs understand co-existence and equality differently. While Israeli Jews support both concepts, they tend to believe that co-existence will lead to equality, despite the majority never having had visited an Arab village or having invited an Arab into their homes. Arab Israelis, on the other hand, believe that equality must come before co-existence is possible. The solution had to be longer-term. However, while successful, there are only six integrated Arab-Jewish schools in all of Israel, with the possibility of integrating only one new one every three years. So what they have implemented instead is the bussing of the teachers — Jewish teachers in Arab schools and Arab teachers in Jewish schools, a program now operating in 840 schools, affecting 184,000 students. For Jewish students, it may be the first time that they have experienced an Arab in a position of authority. For 68 percent of the students, this is the first meaningful encounter they have ever had with the other, and for 92.2 percent, their perspective about “the other” changes to the positive, for both groups. It sounds like it works! 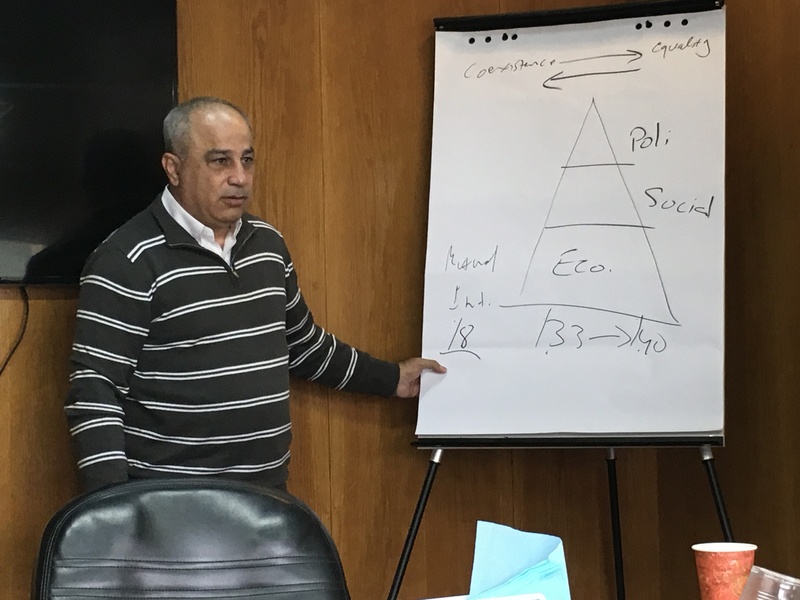 Mohammed shared so much more about the changing face of the economic situation for Arabs in Israel and about the changing economy itself, about women in the workplace, and some telling anecdotes that I will love to share with anyone who is interested in hearing more. Mostly, I left feeling encouraged that Israel now understands that its own economic viability depends on an educated and financially stable Arab population, and is taking real steps to close the gaps. 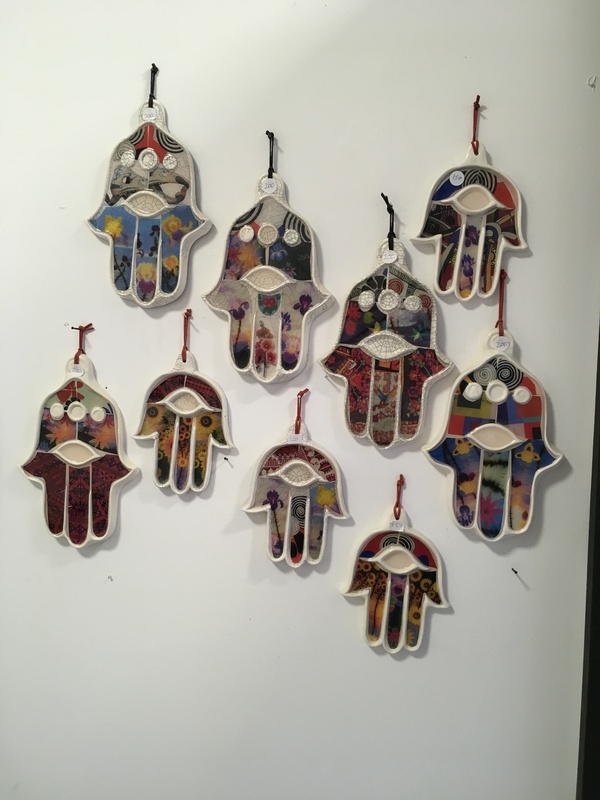 Stop 2, Said Abu Shaka at the Um El Fahem Art Gallery. 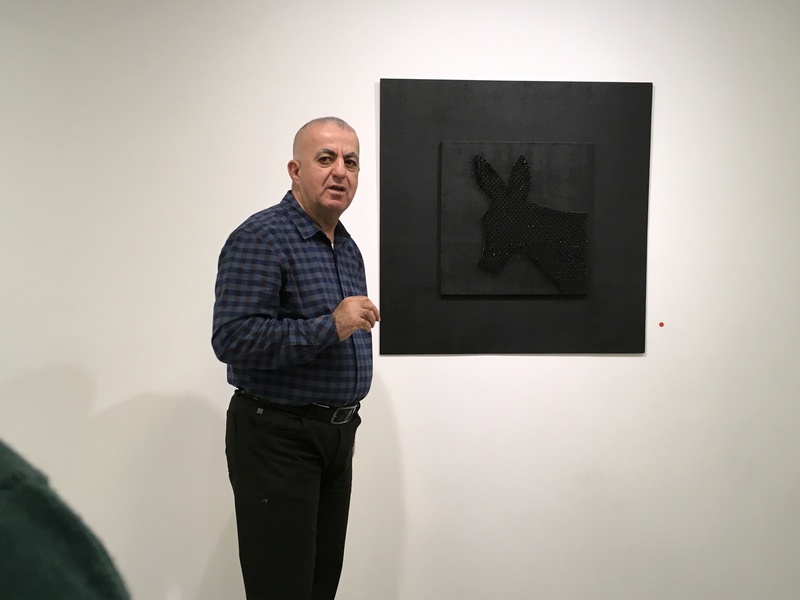 We travelled from Givat Haviva to Um El Fahem Art Gallery to meet with founding director, Said Abu Shaka, who spoke movingly about his poverty growing up, his mother’s love, and his dream of opening this art gallery where Arab artists could exhibit. He said he wanted to be part of the solution, not part of the problem. The gallery includes a ceramics workshop for women to create art. 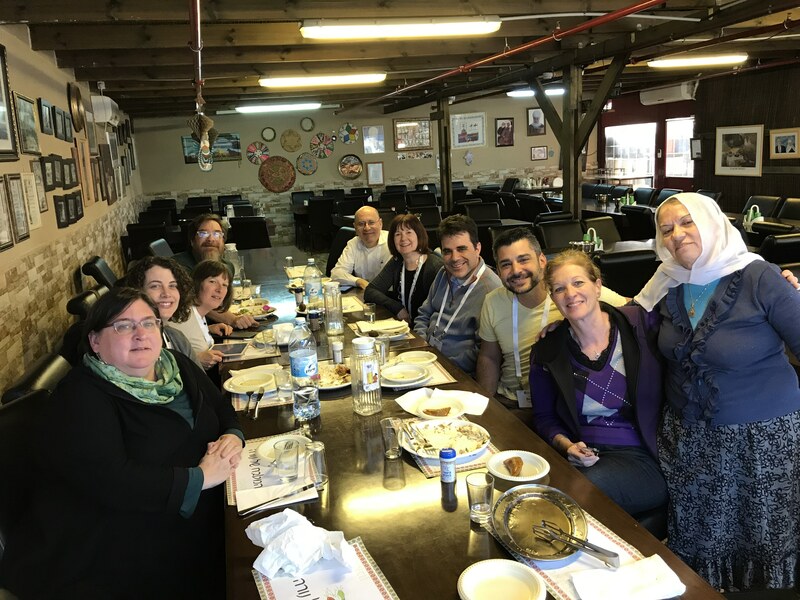 We travelled then to Dalyat haCarmel, a predominantly Druze city, to have lunch at Nurah’s Kitchen. 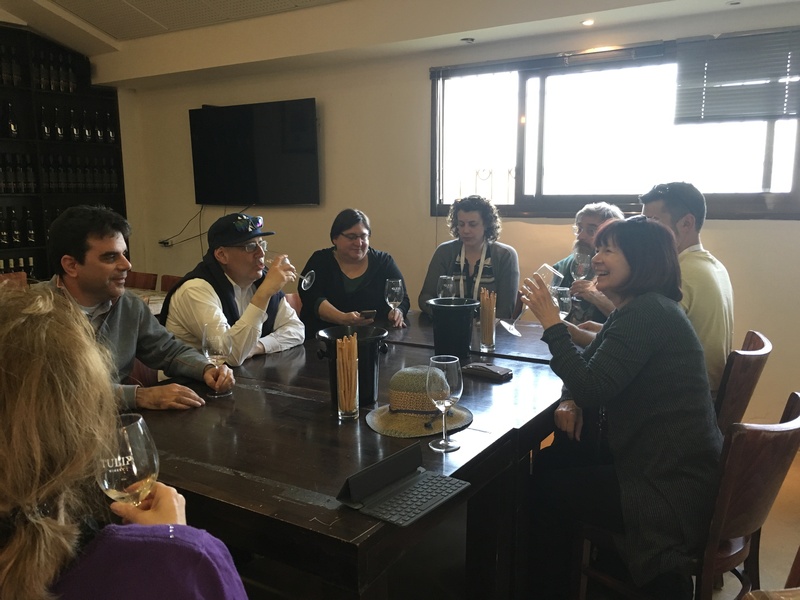 Over a lovely (kosher) meal, Nurah told us some about the Druze community and religion, and our guide Uri filled in some information, as well. Most fun facts: 1. 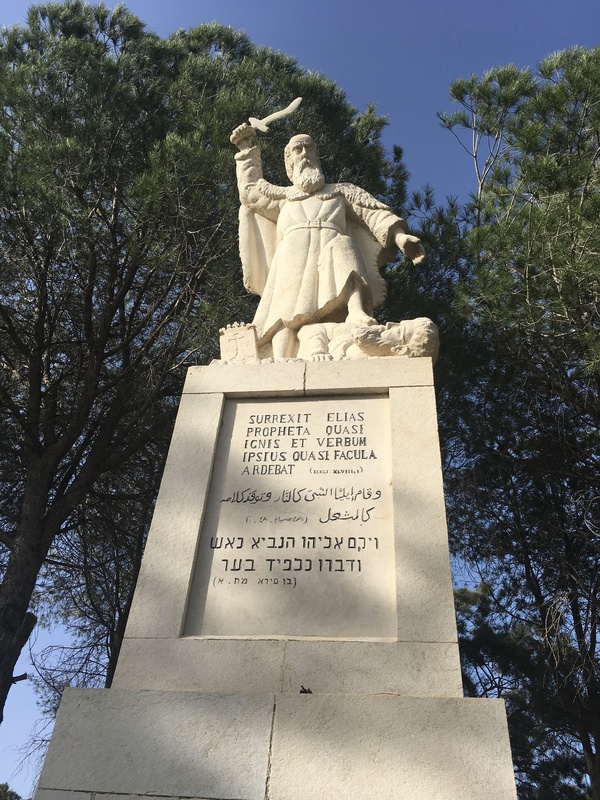 Druze broke from Islam because they considered Jethro (yes, the Jethro who is the father-in-law of Moses in the Hebrew Bible) their true prophet, not Mohammed; 2. Druze are not allowed to enter their holy places if they harbor any anger or animosity in their heart; 3. It is a closed society with no converting in or out; 4. It is a also a secret society with not much known about its religion; 5. There are secular Druze; 6. Druze do not have aspirations for a homeland and therefore are “home” wherever they live. There are Druze communities in Egypt, Syria, Lebanon, and Israel. Most Jews know the kindly Elijah who visits Jewish homes at the Passover seder, at every brit milah, and every Saturday night at havdalah, and we love the folk stories of the chameleon-like Elijah who can appear in different forms to save the day. But the Biblical Elijah was strict, uncompromising, and curmudgeonly towards the Israelites. I like Joseph Telushkin’s teaching that Elijah is punished for his doubt in the faith and continuity of the Jewish people by having to visit us every Passover, Shabbat, and brit milah to be proven wrong in his pessimism — we have and do survive. Stop 6, The Pastoral Hotel at Kibbutz Kfar Blum. 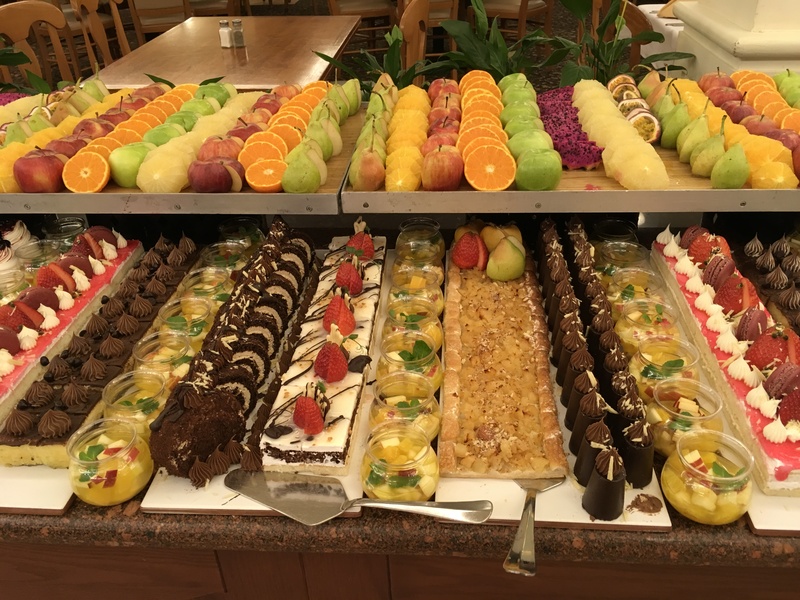 If I told you that this photo represents only part of the dessert offerings, you can only imagine how extensive the salad and main meal buffets were. My roommate Michelle and I are staying in the Whoopi Goldberg room at the Pastoral Hotel, set in between the Helen Mirren and Meryl Streep rooms. This is a beautiful hotel on Kibbutz Kfar Blum in the Galil region. Our dinner was a buffet spread like I’ve never seen before, with gourmet flavors that I also have never tasted before. Another long day concludes, before an early departure for the Golan Heights. Wow!, Pam. Thank you for taking us on another of your amazing open-hearted journeys. With all your senses on alert, your observations and descriptions are informative and uplifting. Next best thing to being there with you. Were the desserts pareve or dairy? Excellent narrative — looking forward to more stories and photos of all when you return. Keep up the blogging!